I completed reading “Running With the Kenyans: Passion, Adventure, and the Secrets of the Fastest People on Earth” by the Guardian Editor and freelance journalist, Adharanand Finn. The 37 year old took his family to live six months in the Mecca of distance running, a village in the Rift Valley called Iten. Finn was a pretty good runner in high school and wanted to find out why the Kenyans dominate distance running. For the past 20 years or so, almost every medal and marathon has been won by the Kenyans. They really took out everyone and truly dominate the sport. The book was a quick read and I was interested to see what Finn found out and how much he improved himself. He formed a team while there and ran in the Lewa Marathon, a race through a National Park in eastern Kenya. I learned much about Kenya and I’ll be watching the distance running in this month’s Olympics with greater interest. Why are the Kenyans the best distance runners in the world? Finn writes that there is no one secret practice or distance running genes, but a combination of things. The country’s favorite sport is distance running and it would be like soccer in Brazil or cross-country skiing in Norway, they are fanatical about it. I didn’t realize Kenya was so big, with a population of 43 million. Cross-country races and track meets are huge events, widely followed in the country with television coverage and fans in makeshift stadiums. Most of the runners come from poor villages where the children run barefoot to school, eat a spartan diet, and generally have a tough and active upbringing. They view running as a “way out” of poverty and if selected to compete in international events, the prize money from say the New York Marathon, can buy them a house and a herd of cows. They spend their days digging in the fields, herding goats, etc, while children in the west are playing Xbox, eating high-fat foods, and getting soft. Once they are selected, they devote their lives to running. This means outside of running, they only rest, eat a restricted diet, and focus on getting better times. They do not work, go to school, etc. All of this running is done at altitude, which also helps them get more red blood cells. There is a genetic component. 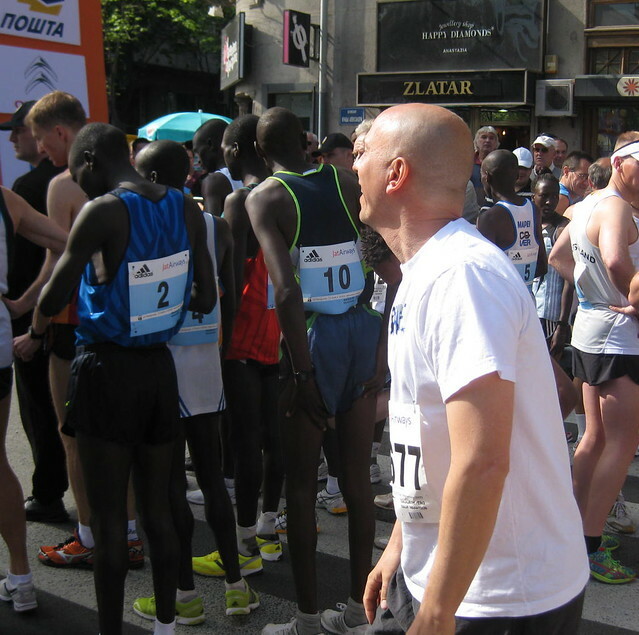 As you can see in the photo below taken this year’s Belgrade Marathon, they are very thin and all arms and legs. 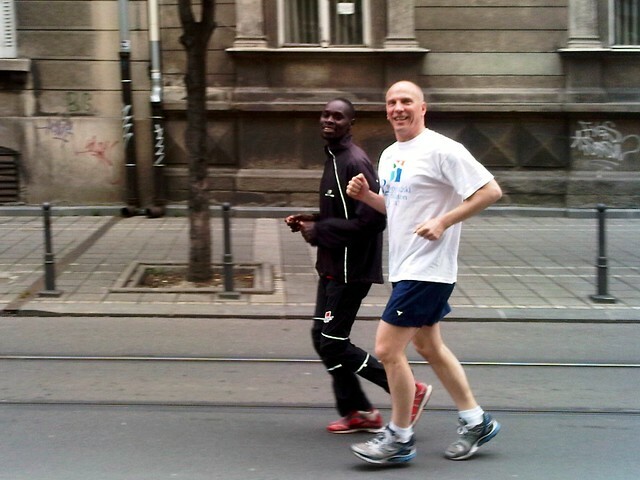 My Slavic upper body bulk doesn’t look as sleek as the Kenyan running machine. Most of the Kenyan’s world class runners are from the ethnic group, Kalenjin and they live in the Rift Valley. I don’t see how Europe or USA can take back distance running and overcome the Kenyans. I also see a bit of backlash, as people note who is the first non-Kenyan in the race and celebrate that finish. I wonder how long their world dominance can continue? I recommend the book to others. I enjoy reading about sports, especially sports that I participate in. The book inspired me to run more and I have this summer. You too come come run with the Kenyans! Nice review. Check out http://www.runwithkenyans.org.